On Sunday, I got out into the Dark Peak area north of my home to research mountain hares for some future projects. The hares exist only on the flat, exposed tops of the Peak District outside of Scotland but even here, getting a sighting is never guaranteed. From a distance, the landscape looks flat and barren and the wind never seems to cease painting a pretty bleak picture making it hard to believe very much can survive up there. Once you get in amongst the heather and grasses, you soon see that on a finer level, the landscape is a bit more complicated. There are deep peat hags, runnels and small gorges strewn within the blanket of heather. The ground underfoot is very soft and springy. Moss grows where the heather can't and the ground as a whole is waterlogged. Peat bogs and moorland provide vital flood defences acting as a sponge to soak up the rain, preventing it from running off the hills all at once and so stopping flooding in the valleys below. Luckily on Sunday, the rain kept itself in the clouds! 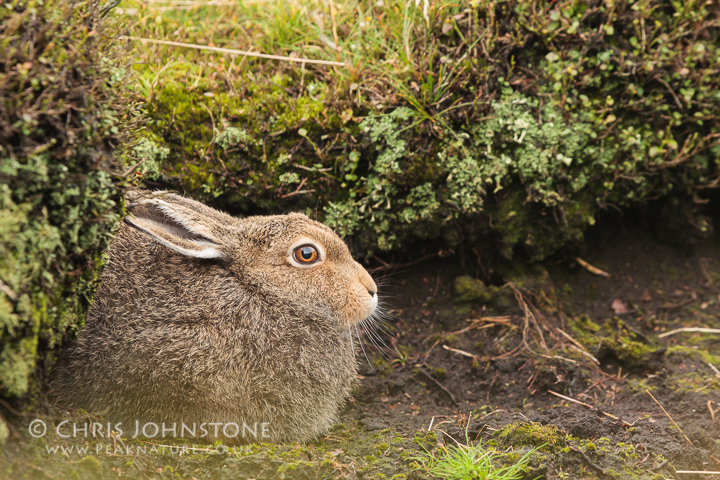 Finding mountain hares always requires a stroke of luck. Normally they are sat up against the side of a peat hag out of the wind but in a landscape consisting of holes and dips in every direction, you can come across a hare, frighten it and it be 20 metres away in a matter of seconds. My only encounter this day nearly ended the same way. Spotting a hare sat on the leeward side of a small depression on my right, I quickly stopped, took a step back and slumped to a crouch. There is often a make-or-break moment in nature photography and today, this was it. To my relief the hare didn't rise out of the dip and dart away and I knew then I'd managed to get down in time. The hare had definitely seen me but had chosen that the fleeting glimpse didn't warrant the energy expenditure to speed off. Now all my movements would have to be slow, thoughtful and careful. From past experience and conversations with other photographers, I knew you could get quite close to these animals - but it took time. So rather than try and move into position straight away, I let my adrenaline subside by laying up in another depression near to where I was crouched. This was just out of sight of the hare and knowing that it was quite happy where it was, I had a cup of tea and a bite to eat. I hate being hungry when shooting; it makes me impatient and clearly this was not the time of hurrying things. So for the next 20 minutes I relaxed out of the wind and considered how to approach the hare again. Leaving my bag and binoculars where I was sitting, I shuffled forward on my front in an arch away from the hare then coming back round to a spot just below its eye level. Over the next 40 minutes I managed to creep a bit closer until I clearly the heather that prevented getting a clear shot. I find counting to 60 helps make sure you are taking your time. Even when patient, it's amazing how quickly you find the experience has gone when you think you've been shooting for hours. Eventually, I was able to gain some trust and shoot several images from different angles. The cloud had made the sky quite dull and since the landscape makes using a tripod inconspicuously, almost impossible, I had to hand hold most of the shots. The IS on my lens certainly helps but nothing beats have a good stable rest of a heavy camera. 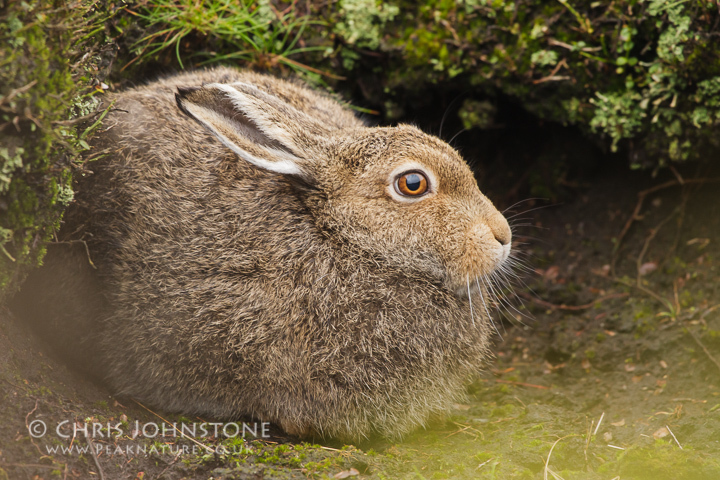 Mountain hares are smaller than Brown hares but as I got closer to this one, I could see it was a bit of a monster. From about 7ft away the warm amber eyes never moved off me hence why keeping movement slow and considered is a must when photographing these animals. With a few more shots at various focal lengths, I was happy and backed away slightly. Once back at my back I noticed the hare jump out of its resting spot and nip over the horizon and gone.